This week I have been up in the Lake District with friends – at a Gillian Travis textile course that was held at Abbot Hall, Grange Over Sands. Our adventure started with a trip to the home of Sticky Toffee Pudding in Cartmel – and the journey there took us through some amazing countryside on a cool but sunny day. The textile course started by taking photos of the local landscape paying particular attention to lines and colour and with an emphasis on incorporating the style of Van Gogh, though from my perspective this didn’t seem to be too successful. Before heading for the fabric we translated our ideas onto paper by making marks in black and white. This gave the opportunity to experiment with pencils, pens, pastels, crayons, inks etc. 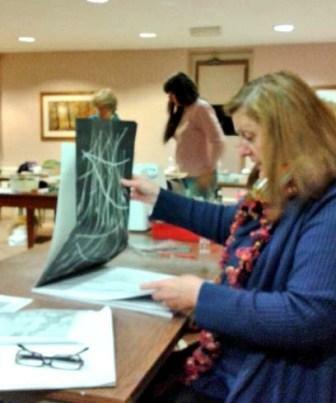 After quietly beavering away Sonia took time out to assess the results of her work. We also practised some Kantha, which is a type of embroidery popular in West Bengal. 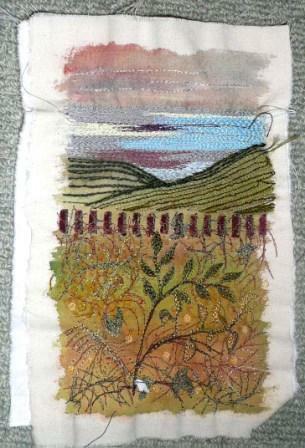 Mine ended up being a bit abstract as I wasn’t aware that we could incorporate other embroidery stitches. 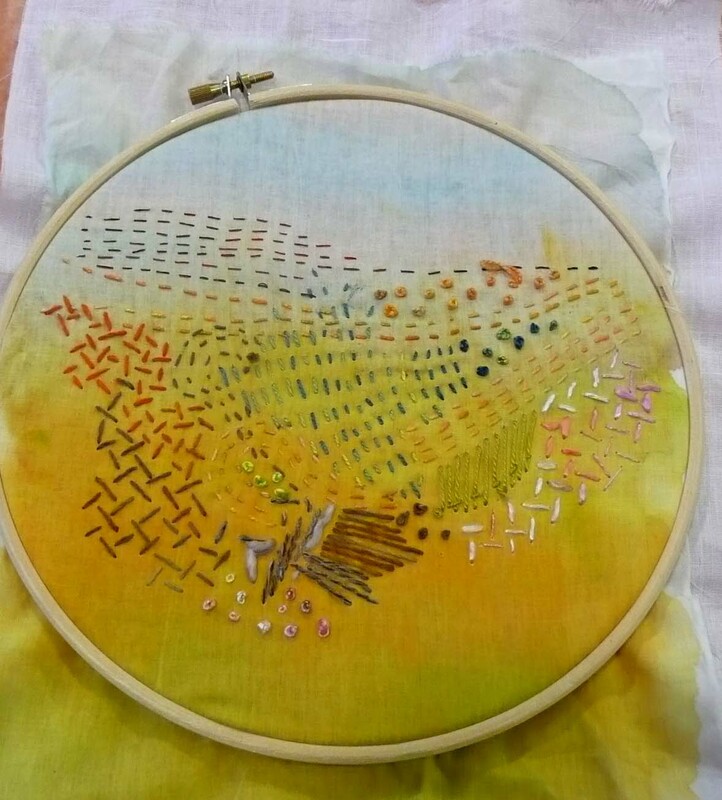 Still, it gave me the opportunity to practice my French knots and seed stitch and I was rather impressed with my painted background, though achieving it was more luck than good management. 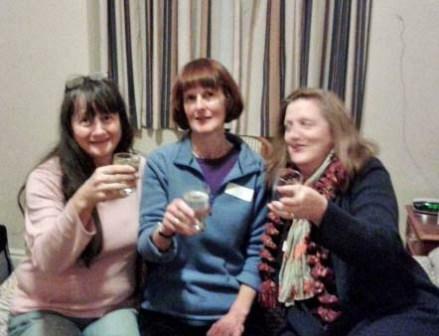 After a long and arduous day it was time to take time out and relax over a well earned glass of wine to evaluate the day. Sonia, (aka Miss Barrow in Furness) was certainly enjoying herself! 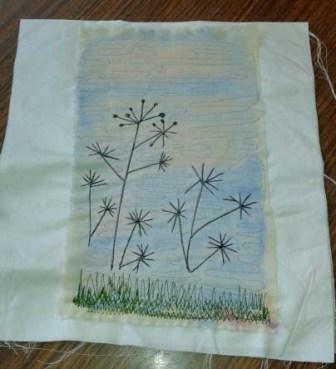 The course progressed with practice in fabric painting and free machine embroidery. 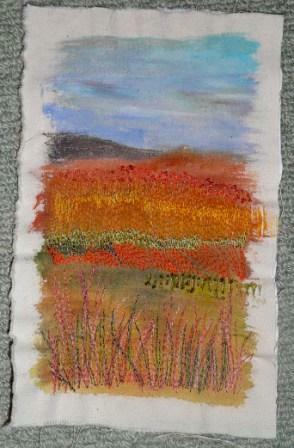 Being a novice at free machine embroidery I experimented before having a go on the painted fabric. This is my first attempt. I have to say I was soon hooked on the Lana thread. 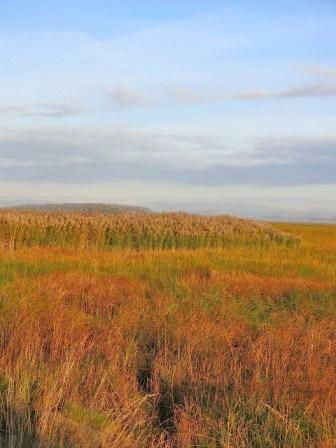 I can see lots of potential for creating fields and woolly sheep! I then created a piece in bright oranges and reds. 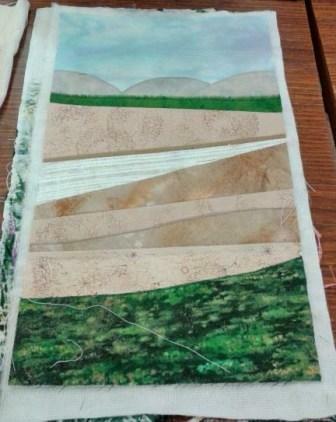 In this piece I used both machine and hand stitch. I would have liked to have the flexibility of experimenting, in my case with Bondaweb, to see what effect it would have given in terms of adding texture to the fields. It is something I will try in the future. In contrast to my heavy handed approach Pam created a much more delicate piece. 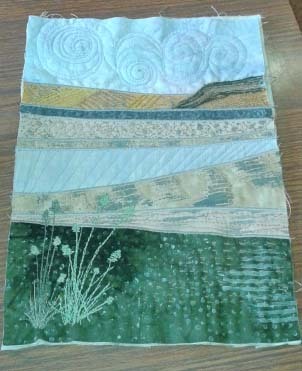 We then moved on to strip piecing which was an interesting exercise. Hilary as ever, did an amazing piece. And I managed something vaguely similar? In between the painting and stitching we did get out to take in the scenery and visit local shops and exhibitions. We visited the Quakers Tapestry exhibition in Kendal which was well worth the effort. 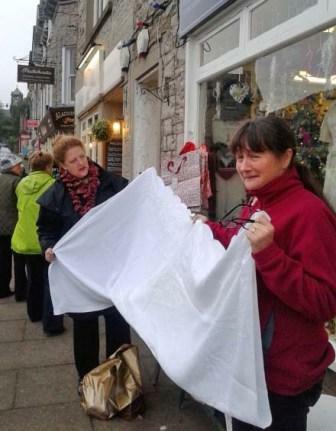 And though Grange over Sands is only small it didn’t take us long to find some lovely vintage tablecloths on the high street. Sonia and Hilary just had to check out the quality and size and one wonders what the locals thought – but who cares? We had a great time when let loose in the afternoons. Overall, I thoroughly enjoyed the week away – lovely people, some of whom were extremely talented – e.g. Stephanie Crawford, and wonderful scenery. And, whilst I learnt some skills I would have appreciated a bit more focus and assistance to make the most of the course. A very special thanks to Jackie who saved the day by having a spare darning foot! Should have bought that piece of cloth! I know – would have loved a photo of that – I must keep my eyes peeled in the future! Pity you missed my skip looting on camera. We were really lucky with the weather and the others on the course. Thanks Jenny for the chocolate. Thank you girls, for your company and mutual support. The wine wasn’t bad either!